“Pop culture matters.” Andrew Breitbart couldn’t be more correct. Conservatives would be wise to follow the blueprints for success he left us in Righteous Indignation. I put off reading Andrew Breitbart’s Righteous Indignation for some time now because I felt as though I didn’t need to. I followed him for years, was lucky enough to speak to him when he visited The Heritage Foundation a few years ago, and knew that his transformation from a default liberal into a conservative in many ways mirrored my own. I thought the impact he had on my life was complete. I was wrong. If not for a night shift I pulled at work, I would have finished Righteous Indignation in one sitting. The most important chapters of Breitbart’s book are those detailing his “lost” years, when he considered himself a liberal, and his ideological transformation upon graduation from Tulane. The chapters on Drudge, The Huffington Post and ACORN scandals are interesting, but they don’t particularly cover new ground. Conservatives know the media is biased. What they don’t know is how to relate to young people. Andrew’s epiphanies hold the key to unlocking a relationship with younger voters at a time when their political identities are still forming. Pop culture matters. What happens in front of the cameras on a sound stage at the Warner Bros. lot often makes more difference to the fate of America than what happens in the back rooms of the Rayburn House Office Building on Capitol Hill. Humor is a weapon to be deployed as often as possible — it is almost impossible to defend against. It is the weapon the Frankfurt School lacked — their seriousness made them boring an inaccessible. [Saul] Alinsky is no such thing. He is hilarious, and that hilarity breeds the sort of social change only a Jon Stewart or a Stephen Colbert could bring about rather than a Noam Chomsky. You must provoke your enemy into reacting so that you can work off of the reaction. If you do a good enough job, you can force them to make a mistake. When they do, you must be ready to exploit. The psychic high from standing up for what you believe in and being attacked for it far surpassed the comfort to be derived from [a] bath of praise. … Revel in the name calling — it means you’ve got them reduced to their lowest, basest tactic, and the one that carries the least weight if you refuse to abide by their definition of you. Don’t pretend to know more than you do. Don’t let them pretend to know more than they do. … You can always puncture their balloon with one word: why. Truth isn’t mean. It’s truth. As I read passages of “Righteous Indignation” to my wife (I’m sure she was thrilled), she deadpanned, “That’s you. You love when they call you names.” She’s right. And I loved Andrew Breitbart because he “got it.” In fact, perhaps the only person within media who gets it even remotely that well … is Greg Gutfeld. We need more Andrews and Gregs. A lot more. And the blueprint for accomplishing that goal can be found in Righteous Indignation. Reading the book has inspired me an has given me a better focus. I’m confident that it will do the same for you. God bless you, Andrew. We miss you. 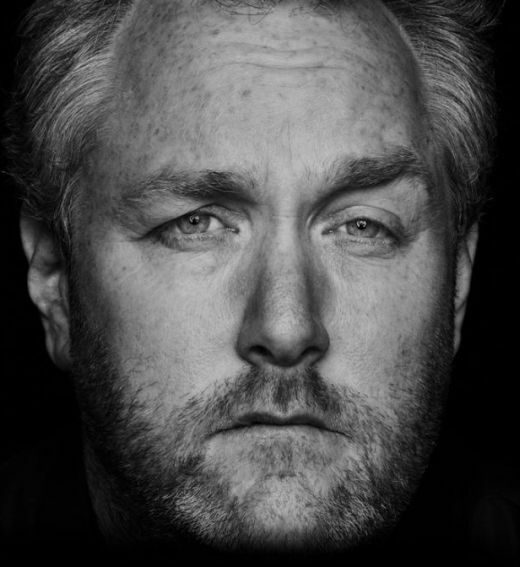 What Andrew Breitbart meant to me, a nobody. Andrew Breitbart left his mark on the movers and shakers of the conservative movement---and we'll hear all about it on the radio and television this week---but what about the nobodies like me? He was an inspiration to us, the nameless, faceless foot soldiers of the conservative movement. And, while we don't have a big audience to tell the tale to, we still have a duty to put that message in a bottle and throw it out to sea. I heard about Andrew Breitbart passing away on the way into work this morning and thought it was a joke. Knowing that the ugliest side of the American left would say despicable things about him, a part of me thought it was an Andy Kaufmanesque event; Breitbart would return unscathed once the online vitriol and twisted Twitter feeds had run their course. Sadly, it isn’t a joke or an ingenious way of holding a mirror up to the left’s hypocritical face. 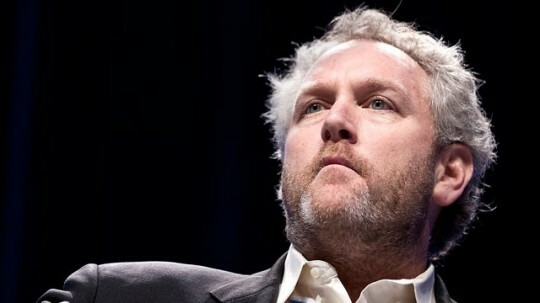 And so, with his passing I watched and listened to the who’s who of the conservative movement talk about what an impact Andrew Breitbart had on them. There was Rush and Sean and Mark Levin. There was Jonah Goldberg, and every professional blogger who ran into him over the past few decades. I enjoyed hearing those stories, but what concerns me the most is that the nameless faces in the conservative crowd don’t have a megaphone to let the world know just how much Breitbart meant to us. Regardless, it needs to be said. Years ago I had no intention of getting into politics. I moved out to Los Angeles to write screenplays and direct independent films. I wanted to be a part of the entertainment industry, but then a funny thing happened: as my political identity began to take shape I found my worldview to be under constant attack by campus Progressives. They warped the words of the men who made sense to me, intellectually bullied those who disagreed with leftist convention, and treated simple disagreements as tell tale signs that I was evil. It completely changed the trajectory of my life. Essentially alone as an undergraduate and later as I pursued my Masters, Andrew Breitbart was a source of inspiration—he stood up to the bullies. And he did it in a way that was intelligent and cool and funny, so that he couldn’t be ignored. He was just as well-versed in popular culture as he was in the best and brightest of conservative thought. Andrew Breitbart destroyed the paradigm that the left could claim “cool” as something all their own. He was an existential threat to their facade and for that they hated him. This little blog gets a fraction of the traffic of NRO, The Weekly Standard, Hotair, The Foundry, Powerline and many other conservative blogs of note, but it exists in large part because of Andrew Breitbart. The greatest joy I receive while writing on politics comes when liberal readers attempt to put me into one of their stereotypical boxes reserved for conservatives—but can’t—because I can go toe-to-toe with them in the popular culture and political realms. Don’t like what liberal Hollywood defines as cool? Then redefine cool by changing things from the inside out. Andrew Breitbart left the world too early, but not before he left a lasting mark on many, many “nobodies” like me. The best way we can honor him is by picking up the baton and racing forward. Seth MacFarlane’s Coffee Cup Glued To Face During Bill Maher’s Show. Breitbart Victorious. Seth's sudden desire to get lost in his cup whenever he had an opening to disembowel Breitbart is interesting. Oh, wait, liberals only come off as public policy geniuses when they're interviewed by their allies or debating the conservative equivalent of Peter Griffin. Andrew Breitbart: Obamacare is a comprehensive package, that you’re now taking the tear jerker utopian thing that everyone is going to clap at when you say Republicans are taking that away—it’s the cost of this thing—it’s an outrageous cost…and this was shoved down not just the Republican’s throat without bipartisan support. 70% of Americans are opposed to this. Bill Maher: First of all, (turning to Seth MacFarlane) help me any time. Bill Maher: They debated for a year. Andrew Breitbart: This thing was not debated in a rational way. This thing was shoved down the American people’s throat. 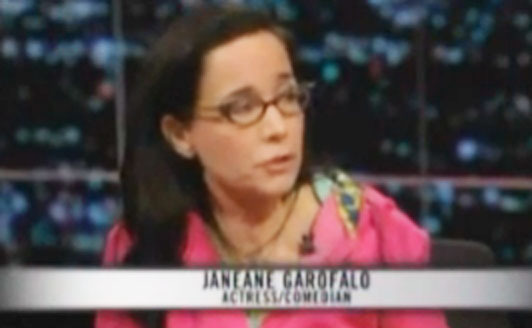 Bill Maher: That was a slow shove—it took a year. I tell ya, if I had something in my throat for a year, I’d be gay by now. That was a slow shove. It’s funny that a year to Bill Maher is a long time when it comes to debating major decisions for the nation as a whole (with a Democrat in office), and yet the decades-plus middle finger that Saddam Hussein gave the international community—and the year of debate that followed when George Bush told the world that despotic, dictatorial “F-yous” weren’t going to cut it in a post 9/11 world—was a sprint to war with the Real Time host. Regardless, this post is about Seth and his sudden habit of sticking cups in his face when he should have been making the Big Bad Breitbart look like the conservative neanderthal every “smart” person knows he is, right? Seth, is that cup glued to your face? Did someone pull a prank on you in the Green Room, or did you just REALLY like that coffee? Seth: We don’t need those tax cuts. Bill Maher: No, we don’t. Andrew Breitbart: That’s hard to believe. I would say this: the idea that this country is going to go through this period…that the Repubican party is going to tap into it the Teaparty thing going on out there…there the people at the grass roots have created this momentum, and the Republicans are trying to tap into it and they have not whatsoever. They are now suffering because of the Teaparty. They have not figured it out…They’re not even close to what the Teaparty wants out there. It’s not just Democrats that don’t know what’s going on, it’s Republicans that are completely lost. What followed was Bill Maher demonstrating for his audience that he doesn’t understand basic Math. Anyone can look at the government’s own numbers and see that taxing “the rich” is not going to save the nation from collapsing under the weight of a mountain of debt. Bill Maher bathes in quixotic ignorance and doesn’t even realize that he’s intellectually naked in front of millions of people. The Government’s own numbers on a wide range of issues are available to him, but instead of honestly examining them and realizing that the ideology he clings to has us on The Road to Serfdom, he’s decided on getting applause lines by mentioning that he cares for kids with pre-existing conditions. Bravo, Bill. And Seth, I’ll see you on the next installment of Real Time, when Bill rewards you with a conservative even Peter Griffin could handle. Bill knows that government data is readily available to him. Here, we're just looking at interest on the national debt. Instead of looking at the numbers and realizing his "tax the rich" argument is a fairy tale in light of the bowel-busting debt heading down the national gastrointestinal track, he'd rather throw out applause lines about sick kids... Guess what, Bill: the NATION is sick. It's a debt junkie that is just now realizing the bill is going to come due. And it's going to hurt. Bad. Breitbart No Spider Rico. 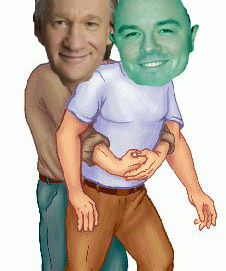 Seth Macfarlane to be TKO’d at Bill Maher Fight Night. Bill Maher will try to come to Seth's aid by performing the Rhetorical Heimlich Maneuver, but Breitbart will likely be shoving razor-sharp retorts down both of their throats. Seth will clam up and look like the back of Stewie’s head in the face of a quick-witted conservative who’s well-versed in public policy issues AND pop culture references. Seth’s time spent around sycophantic fools like Bill Maher, who feed his ego simply because he’s a liberal entertainer with a popular cartoon microphone, will bite off more than he can chew. Breitbart will refuse to give him a rhetorical Heimlich Maneuver and instead finish the job by shoving razor sharp retorts down his throat. Here’s another analogy for you: Liberals like to fight conservative versions of Spider Rico, while trying to pass them off to viewers as Rocky in his prime. They do so on cable news shows all the time. 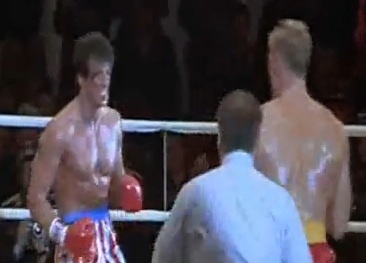 However, whenever they go up against conservative contenders for the heavyweight title they’re the ones who feel like they’ve been on the receiving end of Balboa’s blows. Our liberal friends and Socialist/Commie apologists never step into the ring with the best and brightest conservatives because almost every time they do they get floored. (Or, when they do, it’s often 3 on 1.) With emerging technologies, more people know how they try to rig the match to their benefit. Game over, mainstream media. When conservatism is given a fair shake, liberalism gets knocked around the ring. Charles Blow is in search of the elusive racist Tea Party Bigfoot with clout. 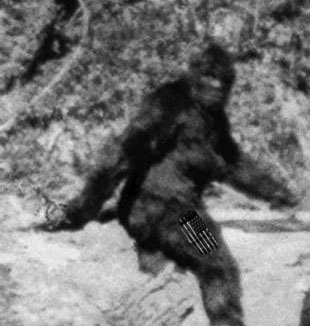 They may have furry American flag markings on their leg, but trust him: They're bad news. reader doesn’t want to investigate “some” and “others” who harbor “subtle” biases. Personally, when I’m dealing with race I like to deal with specific instances and specific people…but that’s just me. Unlike the mysterious racist Tea Party people with any clout that Charles talks about, Reverend Sharpton is regularly cited as a “leader” of the black community. So, when he unabashedly comes out with Communist talking points to a rapt audience, I think it’s worth noting. We’ve got him on video. Case closed. I really wish Charles would just give it up. 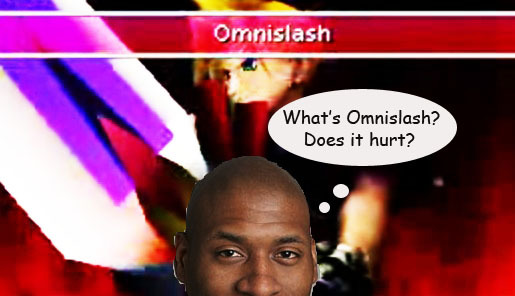 It’s Saturday night and I have places to be, but if he keeps writing this nonsense I’ll have to go Omnislash on him. Did you shave your head Charles, or did all those poisonous thoughts cause your hair to fall out? Note to Mark Lamont Hill Liberals: Come November, Daddy’s Home. I guess it’s Conservative Bionic Commando Week around here, because Greg Gutfeld is on a roll. It turns out that when liberals aren’t trying to paint an entire political party as deranged, violent cable guys for five bucks, they’re going back to the racism well. 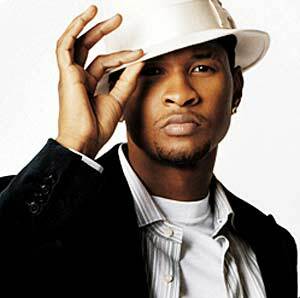 Dear Liberals: We can hate the Nanny State and think Usher is smooth at the same time. Nobody cares about the race card anymore. It's over. Move on. In short, at any large gathering of conservatives a reporter will show up and claim someone screamed the word that shan’t be said. Actually, I’d say it innocuously to prove a point, but the NAACP killed and buried it long ago (Unless it’s possible racist conservatives exhumed it, breathed new life into it, and now zombie racial epithets are rearing their ugly heads at Tea Party rallies). Or maybe liberal LA Times columnist David Ehrenstein has been showing up at Tea Party rallies incognito? Who knows. Can you imagine if “Hip-Hop intellectual” Mark Lamont Hill was on his way to an Obamacare after party and someone threw eggs at his bus? Or maybe he rides a hip-hop train with Quad City DJ’s as conductors? Either way, there would be hell to pay. Without a doubt, Mars Attacks! stunt-double Al Sharpton would recall the non-existent eggs as feces (or maybe eggs with feces inside them because that’s the sort of thing conservatives can concoct at will?) thrown by a “racist” cop. And when the whole thing turned out to be a farce…silence. 1. How could adding 32 million people to the health rolls SAVE us money? 2. How is hiring 14,000 new IRS Agents to enforce this NOT an expansion of government? 3. How can you be considered a “child” for the sake of health care until you are 26 years old? 4. How is forcing everyone to buy something constitutional? 5. How could there be no tort reform in this? The only way the race card works is if you allow it to work (just as zombie-racial epithets only work when the person being insulted gives a word the power to control their life). The vast majority of Americans are not racists and are through allowing liberal race-hustlers to put them on the defensive for what’s largely a non-issue in 2010 America. I’m sorry, but I refuse to believe the random racist loser we all encounter has any power to significantly impact the trajectory of the average black person’s life. Now if you’ll excuse me, I’m late for a meeting with “hip-hop intellectual” Mark Lamont Hill’s graduate level class on how to Bust a Move.